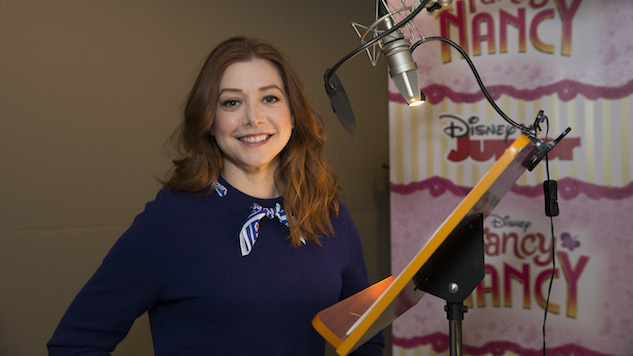 Alyson Hannigan is such a Fancy Nancy stan that when she first heard that Disney Junior was planning to adapt the hit children’s book series for television, she called up her agent and stressed how she’d be willing to play six-year-old Nancy’s beloved pet dog, if only that meant she could join the project on the ground floor. No shade to Frenchy, but with the actress’ decades of experience holding up multiple tentpoles of American pop culture—American Pie, Buffy the Vampire Slayer, How I Met Your Mother—there was never any danger of Hannigan getting stuck playing Fancy Nancy’s non-verbal dog. Instead, starting this Friday, Hannigan will take her bow as Fancy Nancy’s mom, Claire Clancy, kicking off what might well be her fourth tentpole role. Since many of us here at Paste are adults who belong to kiddos right in the middle of Fancy Nancy’s target demographic, we got Hannigan on the phone to get us caught up on her love of Fancy Nancy. The interview below has been edited for length and clarity. Paste: So, we got a chance to watch the first pair of episodes, and are already excited for how excited the kids in our lives are going to be. What brought you to Fancy Nancy, and to Disney Junior? Paste: Are you the dog? Hannigan: I tried! I tried to be Frenchy, but I guess I’m not “Frenchy” enough [laughs]. But yeah, I just—I love the books, and I’m so incredibly happy and proud to be a part of the TV show, which is just so wonderful. It’s everything I wanted from the book, and more. I just love this family, and I love this celebration of Nancy and all of her love of fancy vocabulary words and art projects and just her imagination and everything you sort of want your kid’s childhood to be, she represents. I just love that. Paste: And your girls, they’re pretty firmly still in the perfect age range for this, aren’t they? Hannigan: Oh yeah! Oh yeah, they are so excited, they just cannot wait for it to air. Yeah—I think they love me a little more because I’m doing this. I don’t know if that’s a good thing, but I’ll take it! Paste: Have you read the Lemony Snicket books? They’re obviously meant for an older kid audience, and are much grimmer than Fancy Nancy, but the way Nancy breaks off in the middle of the action to address the audience directly and explain the meaning of a fancy/French word she just used, it really reminded us of the way the Narrator in the Snicket books handles words. Hannigan: No, we haven’t quite reached that age yet. But that is another thing that I love about the show and the books, is that you’re getting all these amazing little lessons and stuff without knowing that you’re getting lessons. Fancy Nancy makes vocabulary really cool, you know? And I thought—immediately, my daughter, she would start using big words and asking about new words, it was wonderful. And she still has that love of language and words, it’s awesome. Paste: That is really great! So, we know you’ve already gotten picked up for a second season, in advance of the Season One premiere—well done, congratulations—but that means you’re going to be in it for the long haul. You’ve done some voice work here and there before, but this will be the first animated series you’re a regular on, correct? Hannigan: Absolutely. My whole life, I’ve always wanted to do cartoons, and I don’t think I was actually really good at it until I became a mother. Maybe it was just all the hours that I spent reading children’s books out loud to my kids, but yeah, something has now clicked where I’m like, “OK, oh yeah! I get it!” Because I think that a lot of my acting is facial expressions, and so to have to not rely on that but to only rely on your voice, it’s like, “OK! This is a whole new world!” But Jamie [Mitchell, series co-creator] is phenomenal to work with, so I’m in great hands, and it’s so much fun to do, and I enjoy it, I think, more than anything? I just love it. These scripts are so wonderful. I love it, I love it, and I just can’t wait for it to come out so my kids can watch it, and so other kids watch it. And honestly, it’s a good show for the whole family. It’s not one of those things where you’re like, “Ooh, you want to watch that, uh, alright, I’m gonna go make dinner.” It is really enjoyable for the family, because it is celebrating this family that just loves being a family and loves accepting everybody’s individuality and passions and it’s just, it’s wonderful. Paste: So when you do the voice sessions, are you in there by yourself, or do you ever get to work off one of the other cast members? Hannigan: I am in there by myself, but occasionally if they have the recordings of the other actors they can play things back for me, which is just wonderful, because everyone is so talented. But otherwise I just read with someone in the other room, or just on my own. But no, I’ve never actually met the other actors. Paste: How surreal that will be whenever you do meet them! Hannigan: I know, it’s funny! Although I guess I did meet Rob [Riggle, voice of Doug Clancy] in passing. We were in this same area at an event and said hi. But I would love to meet my “kids” [Mia Sinclair Jenness and Spencer Moss], that’d be nice! They have really, really great voices. Paste: They do! And with how excited your own kids are about this, is it the sort of project where you might work some quiet magic and get them some side character speaking roles someday? Hannigan: Oh gosh, I don’t know! I’m certainly not going to be the person to thrust them into the business. If they want it, I’ll support it, but I will try to keep them out of it as much as a I can. It’s a hard business, unless you really love it. Paste: I suppose they are about at the same age you were when you started. Fancy Nancy premieres today at 11 a.m. Disney Junior and the Disney NOW app.